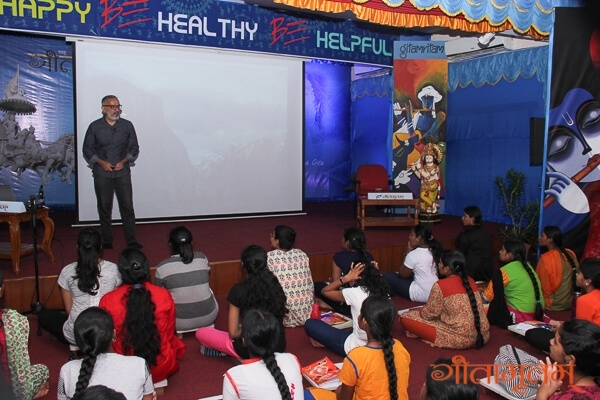 Celebrity photographer Shri C Radhakrishnan spoke about his life and passion to the Gitamritam campers. He started his talk with a slideshow of some photographs. He spoke of how his young son gave him suggestions for creating videos on Youtube. He said that he is here to learn from youngsters and that learning should never stop in one’s life. He spoke of his early life in Ernakulam. He spoke of his simple life, playing cricket and how his life revolved around his home, his school and the temple. He spoke about his mother’s love for movies and him listening to movie narrations from his mother and he was always eager to know who the cinematographer was. This is where his visualization capabilities started. 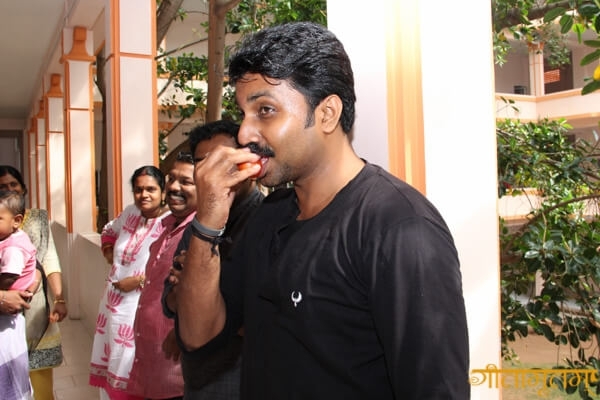 After schooling, he had to move to Hyderabad to look for a job due to his family situation. His typewriting skills came handy in finding a job. He said anything that you learn will become useful in life, whether you learn by force or out of interest. Later he learned television mechanics. He got his first camera when he was in college and that is how he started being involved with photography. He started by taking photographs of events like birthdays and weddings and his work appreciated by people. 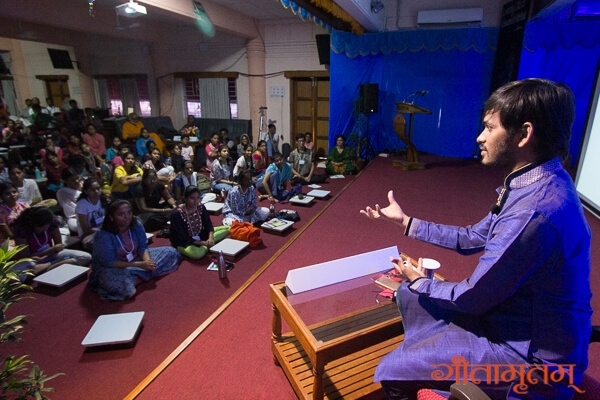 He missed his college exams when photographing one such event, such was his passion. He said it is important to understand what one is interested in, and people to support a successful life. “Passion is something you will do even if you have a billion dollars in your bank”. This is how he explained passion, to the students. He said despite that amount of money one should be pursuing his/her passion and not want to rest, and that is the seriousness with which one should pursue one’s passion. He advised that there are two major requirements to pursue one’s passion. One is to stay in an environment that would evoke the passion and let it come out. Next, it is important to recognize it early and test if that is what one wants to do in life. He decided early in life to go to Mumbai to become an advertising photographer. He said that when we think about something very seriously, nature will conspire to present the opportunities in front of you. People who he did not know gave money or film rolls, and he got opportunities to meet the right advisors. Nature conspires to send you the messiahs at the right time to help you, and we realize these messiahs only later in life. He then spoke of his career and the hard work needed to establish his career. He shared his experience of how he met Amma in Mumbai and how Her blessings got his big break to do a shooting on Mother’s day. From that day on he never had to look back on his career. Finally, he said he would talk of any phase in life as a struggle since he did what he loved. 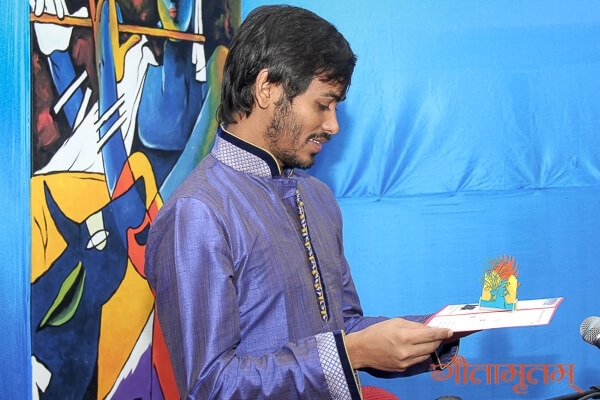 He then shared several photographs and the experiences taking them with the audience. He left the campers inspired with his humorous and interesting talks and his passion for photography. 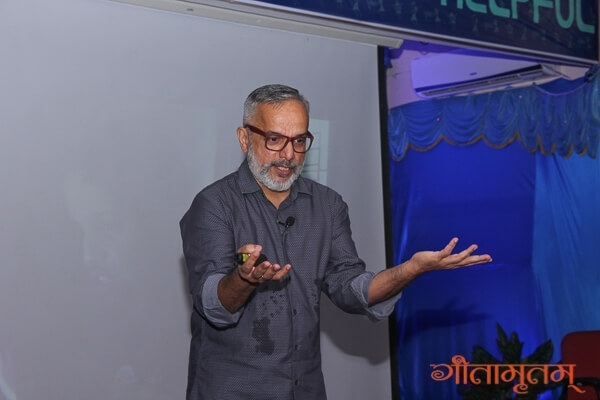 Shri Vinod Kumar Pandey enthralled the young audience with anecdotes from his life and shared his passion. He started the session by asking the youngsters “What is life? Who do we owe our life to?”He said that parents are God for each of us, and we owe everything to them and must take care of them. He said that he got this advice from a saint when he was young. The saint said that if we pray to God for our parents’ well being, we will be happy, and so will our parents, since our parents always care about the children’s happiness. He went on to talk about passion and explained that for each of us, our interest develops in a direction and it drives us. That becomes our passion and makes us love our life. Passion, however, is demanding, it will force us to work very hard, and make us devote our energies. Therefore decide what you want to become early in life. He said that even animals and insects are passionate and love their lives. Passion can also be for one’s well being. 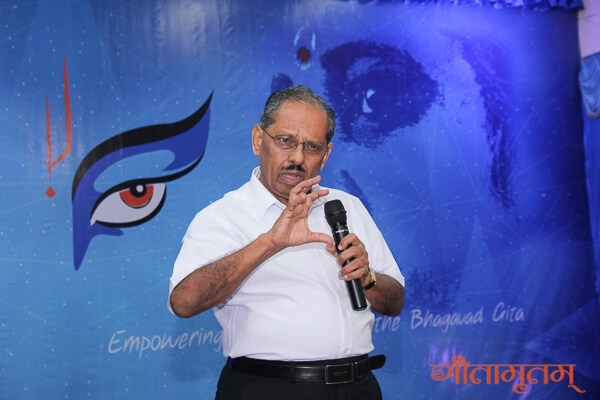 He gave an example of his father who was born in a poor farmer’s family and was passionate about getting an education and improving his standard of living, that made him work hard and get to a good position in life. He learnt honesty, dedication, punctuality and work ethics from his father. He then went on to explain his journey after joining the Police Force. He spoke about the training period which was rigorous, and at high temperatures. 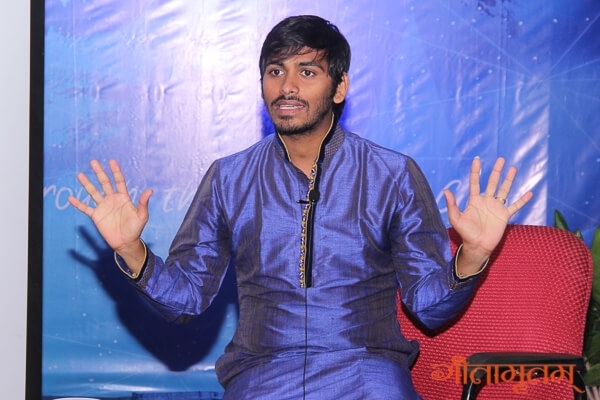 During the difficult phases, he spoke about how he kept going considering his family situations. After passing the training he was placed in different positions, but he was not happy with the work profile. He later applied to CBI and got selected. His first assignment was the Bokaro Steel Plant theft case, which was a challenging case, that many officers refused to handle. He explained how he solved this case through perseverance and strategic investigation. He said, “When you are passionate about your job, we can handle people who threaten or lure you”. He went on to give interesting anecdotes from his other case, the JMM bribery case. 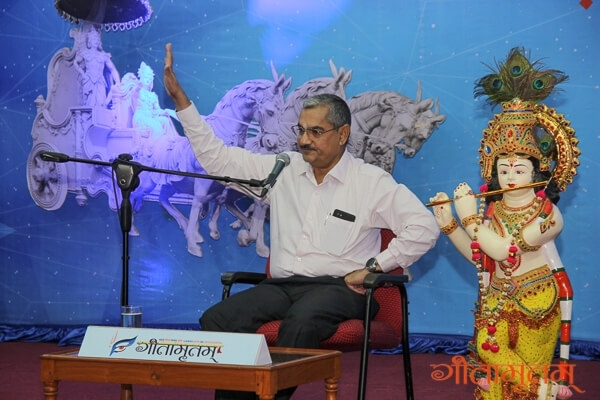 He explained how he surrendered to Lord Hanuman to help him solve the case whenever things became tough. He enthralled the audience with his adventures and how he overcame difficulties through honesty, intelligence and determination. 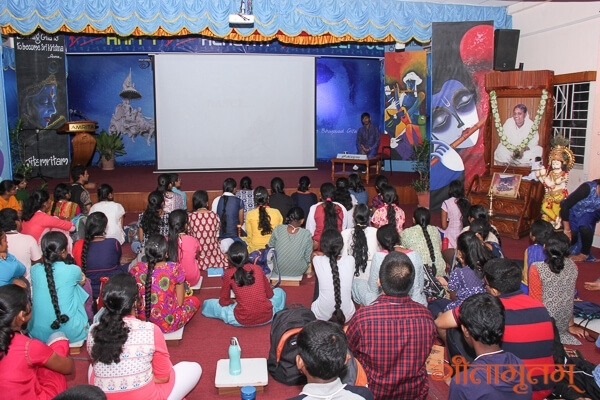 He kept the campers enthralled with how he solved different cases, how he overcame difficulties and fear many times. His devotion to Hanumanji helped him in such situations. 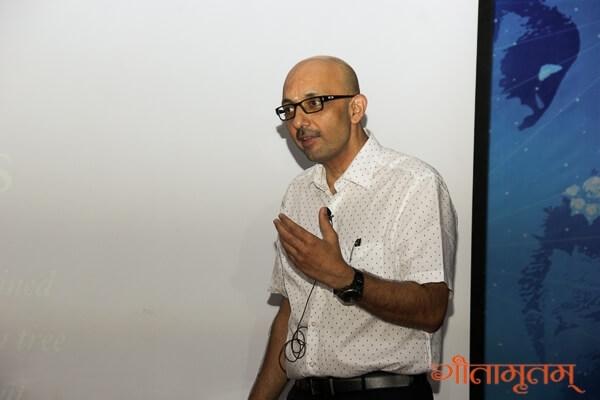 His passion for solving his cases was evident from his talks. He said that despite reaching top positions he has the drive to do more. 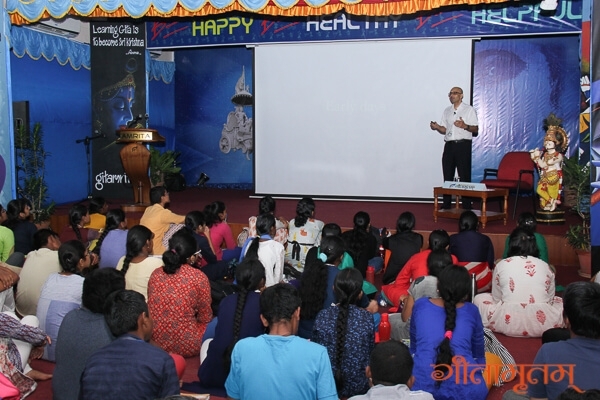 He advised students that one must be fearless, honest, dedicated, work hard and be punctual and sincere. He said that he was not even thinking about his family when solving such cases. He reminisced about his long hours at work and how he did not even realize that his baby boy had started sitting. Such was his dedication to his work. His wife who is also in the police force was supportive and understanding. The students were inspired by his life and passion. Dr. Mohit Sharma Clinical Professor. 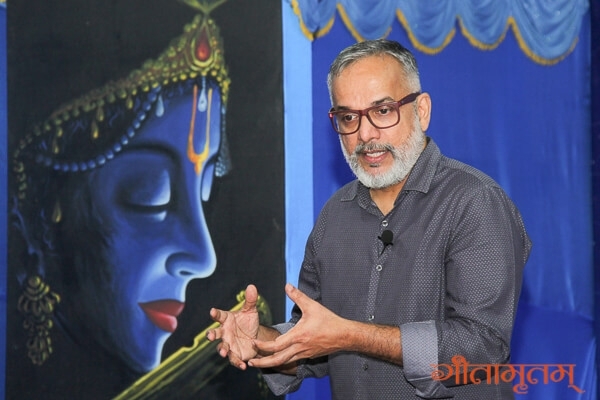 Specialist in for Plastic & Reconstructive Surgery, Burn Surgery, Ear Reconstruction, from Amrita Institute of Medical Sciences spoke about his life and passion. 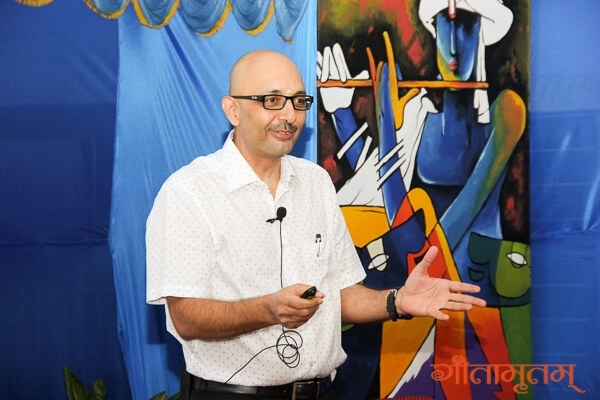 Dr Sharma started with his experiences in school. He said that all through his life he always wanted to improve and do something better. Through an anecdote from childhood, he advised that it is important to be straightforward and simple and express clearly without hesitation. 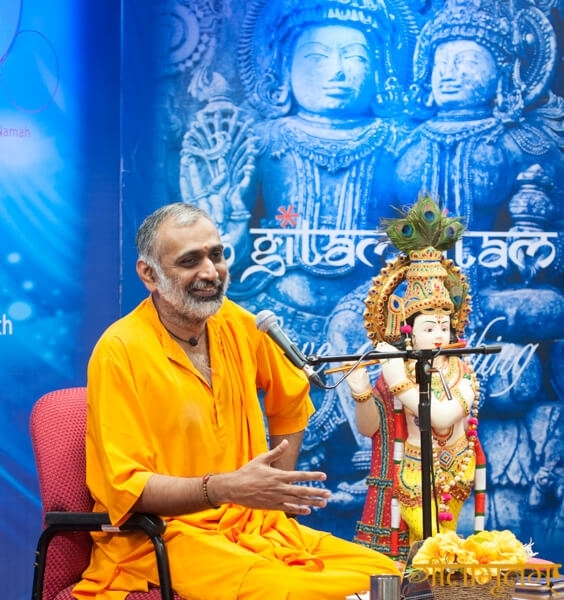 He explained that being straightforward and simple is one of the divine qualities mentioned in the Gita. 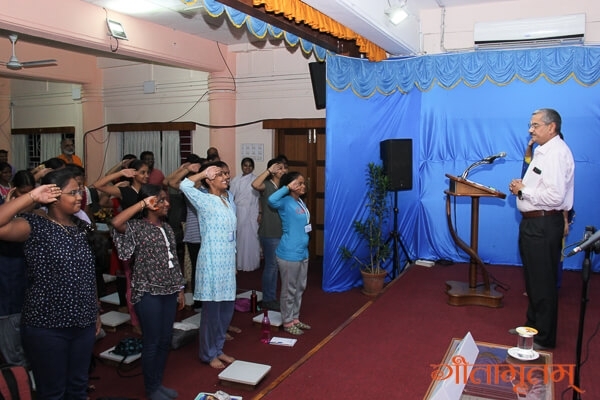 He spoke of his experiences in a camp during his fifth grade where he learned that to do service to country one needs “tan, man and dhan’’, i.e. body, mind and wealth. It is not wrong to earn money righteously to help others and help our country. His interest in medicine kindled when he read magazines about heart surgeries and heart transplants. Despite his interest, he said he was an average student with an aversion towards Maths, and he decided to overcome it and wanted to get rid of the label of not being up to the mark, and during his 10th grade, he worked hard in his studies, especially Mathematics. His hard work helped him get a distinction in his exams. 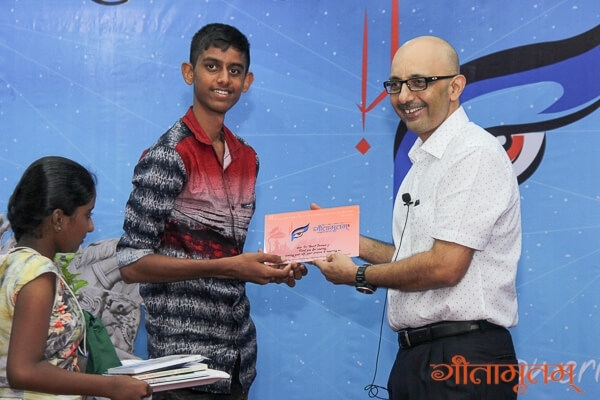 He said that it is essential to have a single pointed focus and that helped him focus during his twelfth class on biological sciences and do well in these subjects. 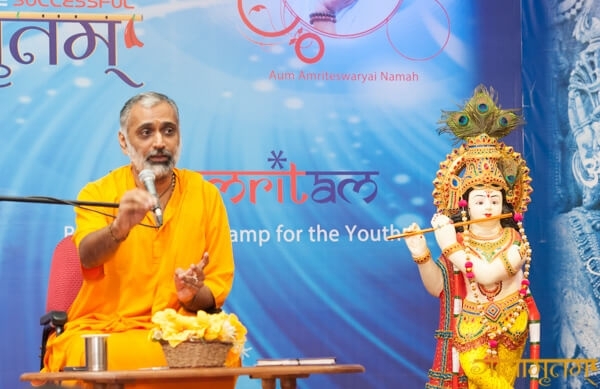 He was especially inspired by the shloka that says that God’s grace can make a mute speak with eloquence and a lame person climb high mountains. He felt he can do something incredible if he has faith in God. According to Dr Sharma life is 90% grace and 10% effort. He advised that when one serves elders and teachers their blessings comes back as grace. 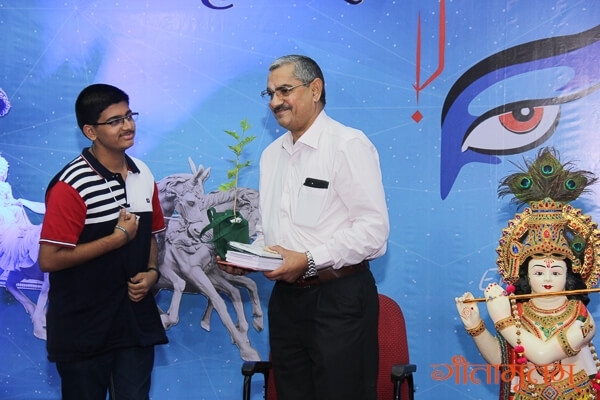 Understanding his strengths and weaknesses he put in the right effort to get into the medical college. Grace helped him do well in the entrance exams and he got an admission for MBBS. His advice for students was that they should join medicine only out of love for the subject, not out of compulsion, without passion the pressure becomes stressful and difficult to manage. He also mentioned that hard work alone is insufficient, intelligent hard work is important. He recollected an advice from a doctor that branches are not important but persons are important. If people are good, then that branch flourishes. 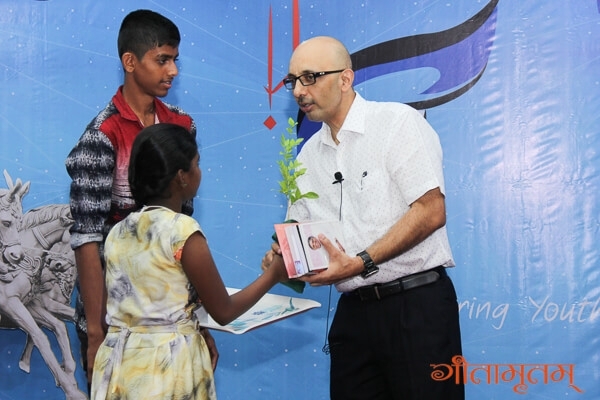 He advised the students to take the branch based on interest and not based on its popularity, short gains or easy life. Passion made him pursue surgical sciences. 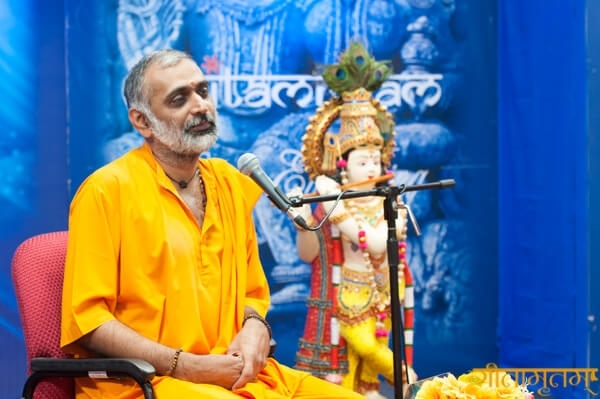 While doing his MS he got acquainted with Swami Ranganathananda and other saints. 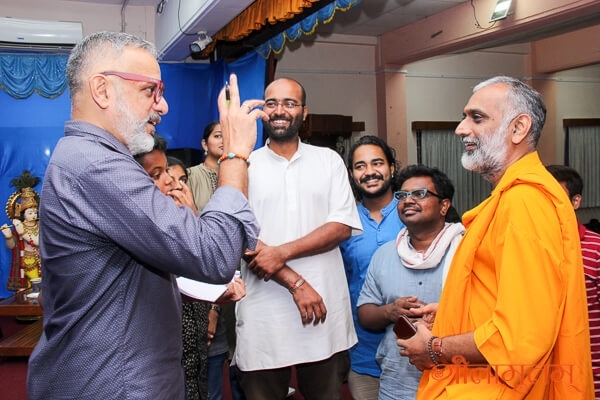 Once a Swamiji took him to Amma. 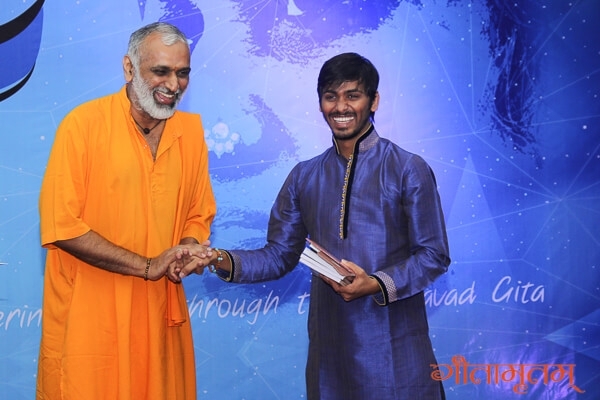 During the program, he was called by Amma, and Amma asked him to join AIMS after completing studies. After completing MS, he started preparing for Plastic Surgery entrance exam. Since he did not do as well as he expected, he was at the top of the waiting list. However, his passion for plastic surgery drove him to meet the Head of the division at the University of Delhi to allow him to observe his surgeries without pay. Within four months he was allowed to scrub in and assist in these surgeries. His passion and perseverance and being available gave Dr Sharma the right opportunity in plastic surgery. He tried the entrance again, however, the second time it was much tougher. Due to the grace of God he got through this time. 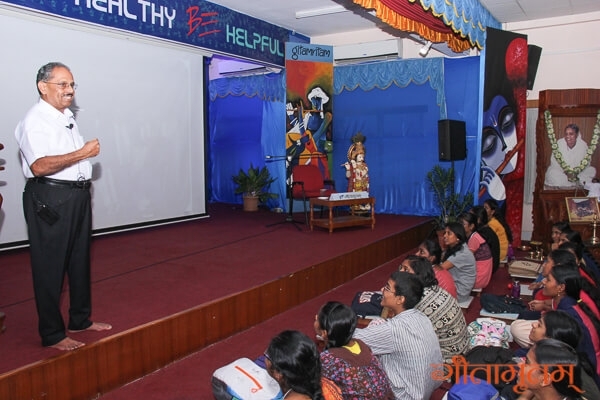 Through this experience, he demonstrated to the student how one should fight through challenges to do good to humanity. After his training, he joined AIMS Kochi in the plastic surgery department. He spoke of one surgery he performed in AIMS when they reconstructed the tongue of a patient affected by oral cancer. This groundbreaking surgery took him to England for a couple of fellowships. He then spoke of the successful hand transplants performed by his team. Throughout his talk, he gave examples of how grace helped him get through obstacles; “If you have tremendous self-effort and grace of God, all success will follow”, he concluded with these beautiful words. 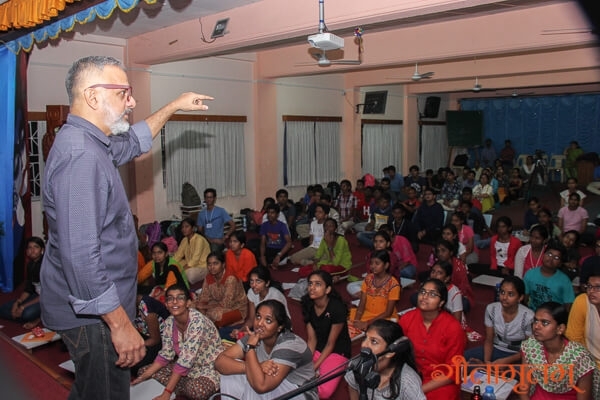 Dr A. P. Jayaraman, a world-renowned scientist from BARC and a passionate science communicator shared his life and his passion for science with the campers. His interaction was filled with interesting and humorous anecdotes from his life. He started by showing a picture of himself with Stephen Hawking, and humorously referring to how he was not easily recognized, while everyone can identify great men from great distances. That is the travesty of our times, that we do not recognize people standing in front of us many times. 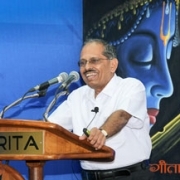 A celebrity journal asked Dr Jayaraman to explain Hawking’s contribution in a sentence, and he replied that “Hawking derived the total wave function for the universe”. However, this is not easily understood by many, as science is many a time explained in a complex manner. He humorously mentioned that professors tend to give complex and abstruse explanations. He says that one’s ability to marginalize and universalize a problem is a good exit strategy in tricky situations and a good skill to learn. He explained how despite being a renowned scientist, was having trouble solving Engineering problems his grandson brought to him. He said that every generation is log cycle ahead in IQ and two log cycles ahead in intelligence. He shares his birthday with Edward Teller, father of the hydrogen bomb. While they share the same birthday and visited the same places, he has not done the same things as Teller. Dr Jayaram explains that correlating lives is not effective and is fruitless. He said that if we look at our fellow mates who travelled the life along with us, each will write a unique story. 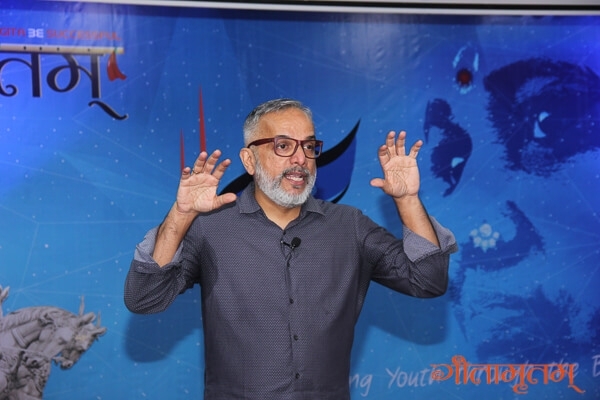 He spoke about how memory helped during his time but now information is available on the internet and that the ability to process information and create new knowledge is valuable today, not the ability to carry volumes of information. Inspired by Dr Bhabha’s invitation to people to become nuclear scientists, he applied to Bhabha Atomic Research Center in Mumbai, his career spanned 40 years in BARC. He also spoke about how he joined the people science movement in which top nuclear scientists helped save the Silent Valley. He also explained his project on developing a solution for converting sea water to fresh water, which is a major contribution of his team in BARC. His work to purify water was inspired from his interactions with Prof. M. S. Swaminathan, which was presented to NASA. 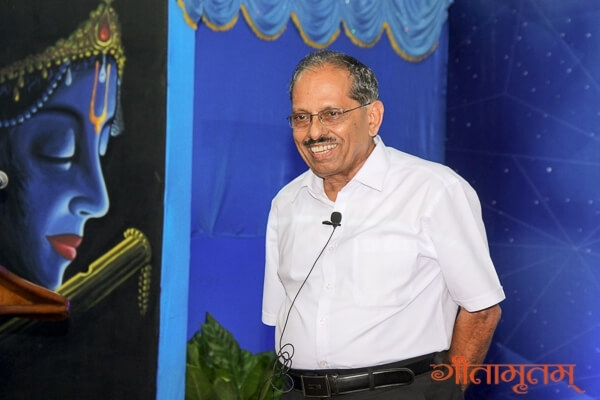 He advised his students to have minds like Dr C V Raman and Mendeley, combining depth and breadth of the mind in addition to creativity. 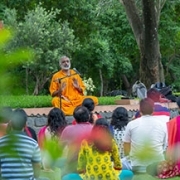 In addition, he emphasised that one should have ethical and a spiritual mind, which Indians obtain from a single source. He also spoke about his work with his colleagues to create interesting stories that help make scientific concepts easier to understand. His talk inspired the students and gave an insight into scientific thinking, the treasure of knowledge obtained through experience, and his passion for teaching science. I found a role model. -Keerthana. We are inspired by him. 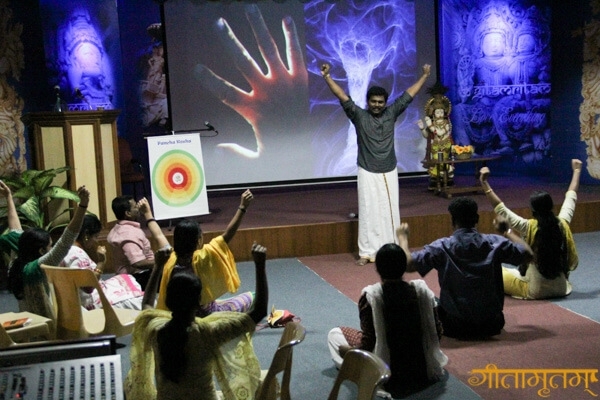 -Sooryanadh, Anirudhan Menon, Radha S Navada, G Sripujitha, U Shriram, Subiksha, Narayana Pillai, Aadarsh Kalyan, Treshai Hary and Amrit. Got many scientific ideas. -Sooryanadh. 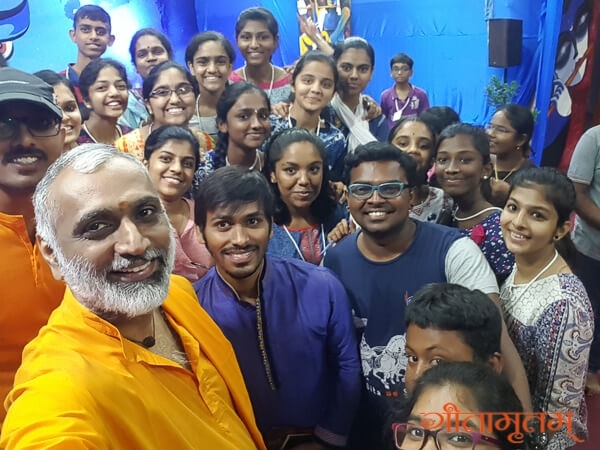 We are amazed by his wit, energy, intelligence and views on education and this generation – Abhinav Saikrishna, Devika Vinod, Adithya Kartha, Anirudhan Menon, Anagha Manoj, Radha S Navada, Prathiksha, Yashas Kumara. 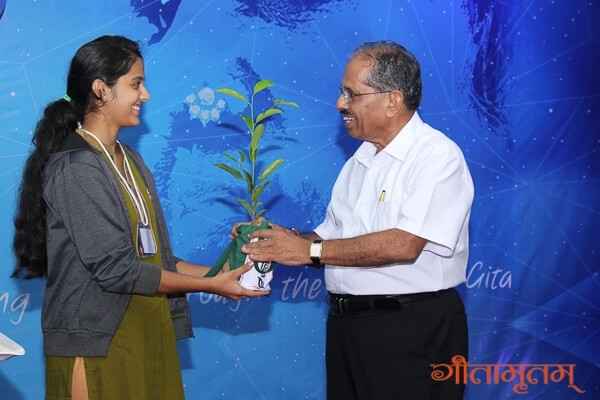 Amazed by his contributions to Science – Devika. Learnt how to choose friends and how important that is to our future. 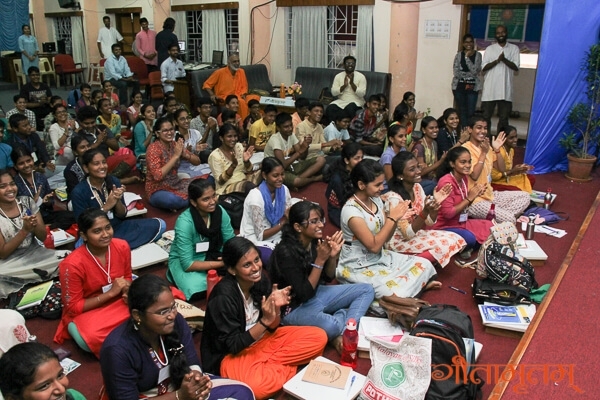 – Devika Vinod, Sandhiyae, Aadithyaa, G Sripujitha, Ashwannth. Inspired to follow my passion. 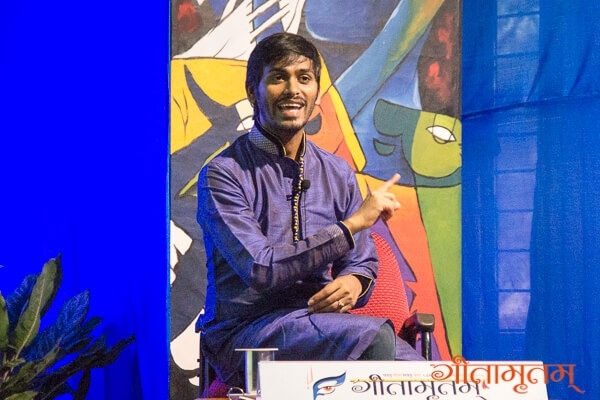 – Anirudhan Menon. Learnt the importance of dedication and never giving up. 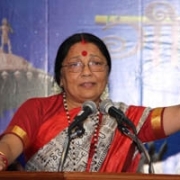 – Kushagrika Marwaha & Deva Prakash. Liked the fact that you mixed science in the stories of cooking of food. 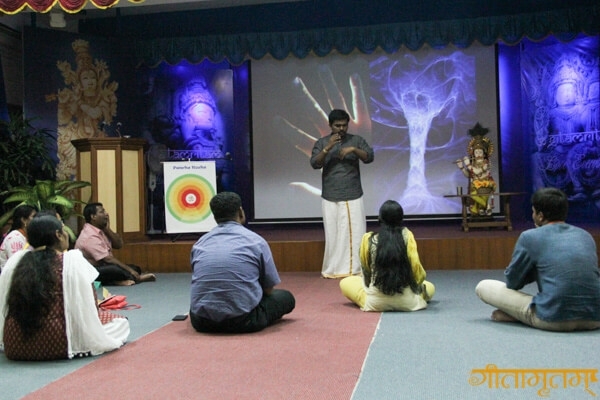 – Samhitha Panuganti, Subaharitha, Buvana, Logesh, Subaharitha, Achyuth, Narayana Pillai, Buvana & Vaidoorya. 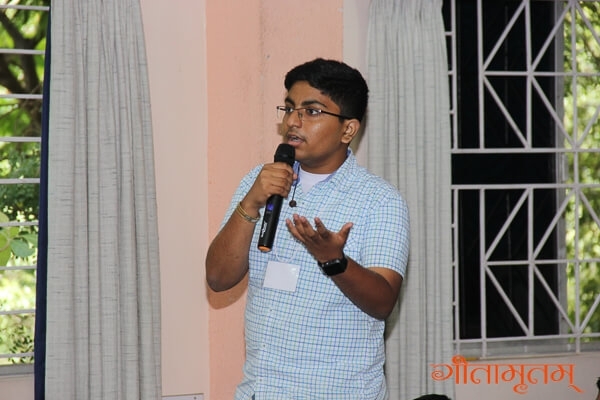 Astounded by his knowledge of Science – Aditya. Taught me that even the minutest parts of the world have an impact. – Vidya Suresh. Got really good pointers on how to study. 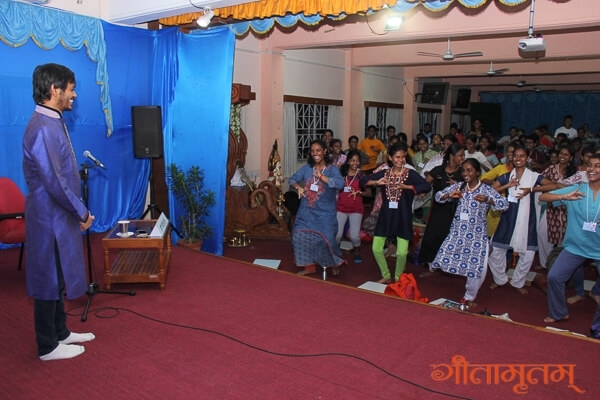 – Mathipriya, Subiksha & S Shiva Dharshan. Learnt that we can learn everything. -Sachin, Anupama. Came to like science because of him. – Tamilarasi & Ananya. Learnt that creativity can help in pursuing a passion. -PM Dharsshan. Learnt that passion has no age limit. -Ramyadevi, Keerthana & Aadarsh Kalyan. He is just like an encyclopedia. – Prathiksha. Love his dedication towards his passion. 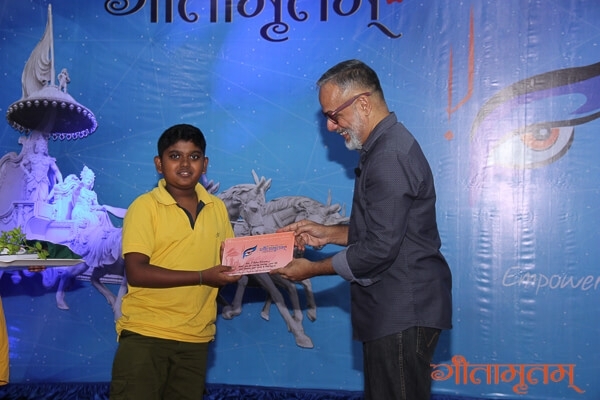 -Amruth Ganesh & Aadarsh Kalyan. Learnt how important hard work, smartness, and never giving up is for success. 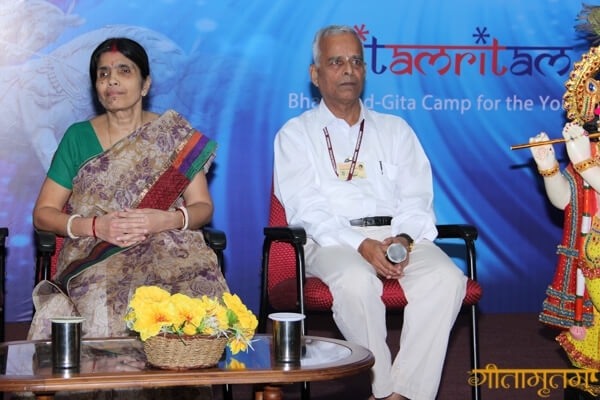 -Amruth Ganesh, G Sripujitha, U Shriram & Pramarsha. 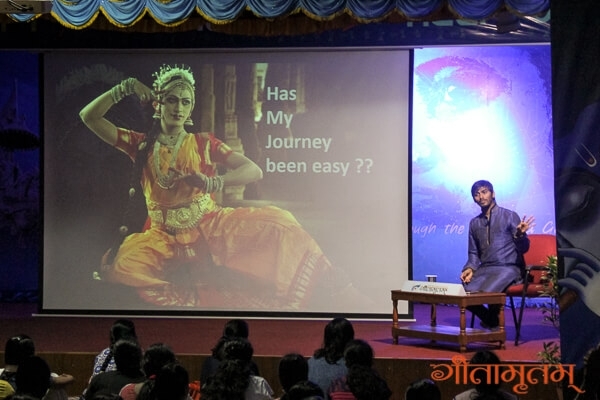 The Kuchipudi dancer and actor Shri Haleem Khan enthralled the Bala audience with his fascinating life. The session started with a short and wonderful promo of his dance and his life. “Born into a conservative family, Haleem Khan demonstrated that art is beyond religion and creed“. 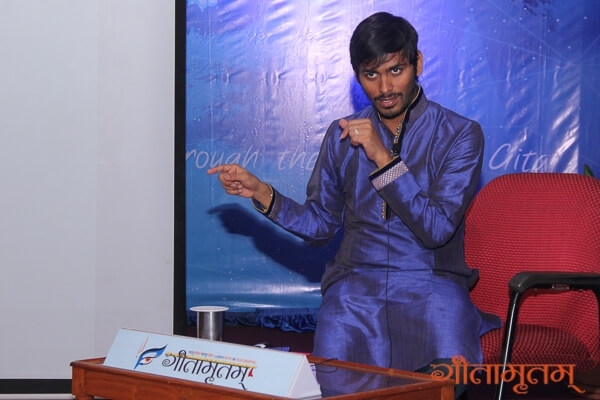 Introducing his journey of life, he said: “For me dance is everything”. 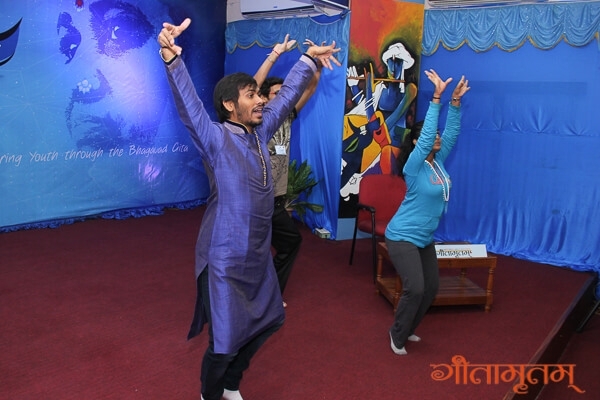 Combining humour and bhava he took the audience through his journey. 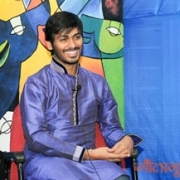 He spoke of how he used to watch and enjoy classical dance programmes on TV for hours when he was young, and this slowly turned into an obsession and he wanted to learn dance. 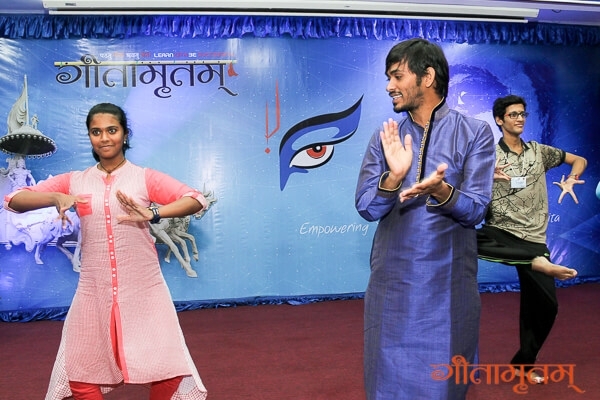 He explained his family situation and how he silently and patiently waited for the right opportunity to learn dance. When he found the opportunity, he persisted in getting his first teacher in accepting him as a student, who was initially apprehensive of teaching him. He secretly continued his classes with this teacher, and later with her Guru. He explained how he used to practise in the bathroom and secretly continued his classes and practise for almost four years. 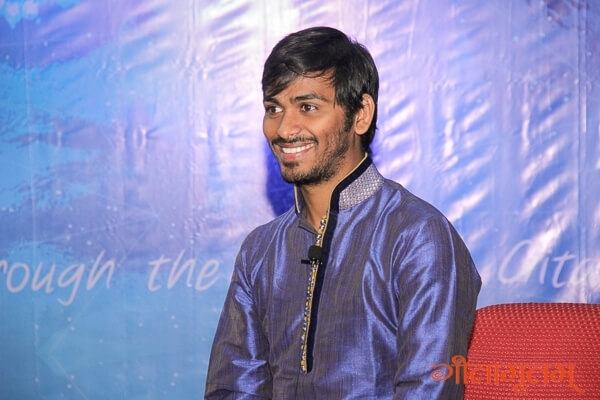 His passion drove him to move to Hyderabad on the pretext of learning hardware engineering. There he got the opportunity to teach dance, and perform on stage. As he was balancing his passion for dance, his programmes and his work he decided to pursue dance as a career, risking failure and other challenges. 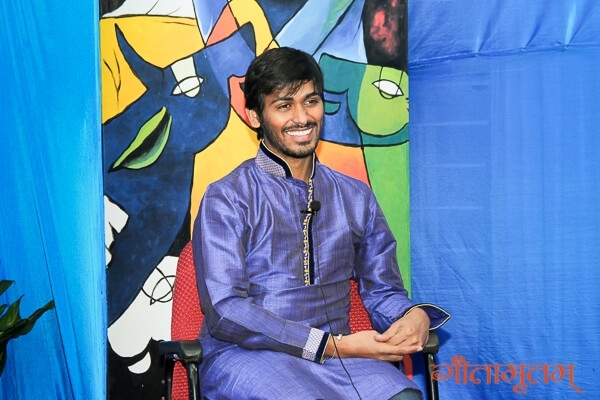 He also spoke about how he started donning female roles as a Kuchipudi performer. He then gave a humorous recollection of how his family came to know about his dance, when a local TV came to interview them and how his strength, his dedication to his art helped him convince his family to accept this. Convincing family and overcoming the differences was a challenge and he explained how he managed the situation of a man donning a female role. He wanted to preserve the tradition of Kuchipudi where traditionally men don female roles. 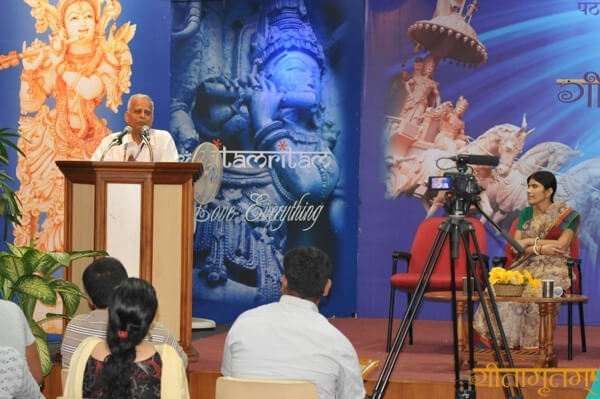 He said even today we learn Bhagavad Gita since it is not just a book, but our culture. We have so much to learn from it, and it is our tradition. Similarly, he wanted to carry on the tradition of Kuchipudi and pass it on to the next generation. He slowly delved into the contradictions of his religion of birth and the religious aspects in the dance he was pursuing and how society looks at it. He told the audience that for him dance is his religion. This he says is how he sees his India, his religion and life. He explained how this was natural for him as a dancer. 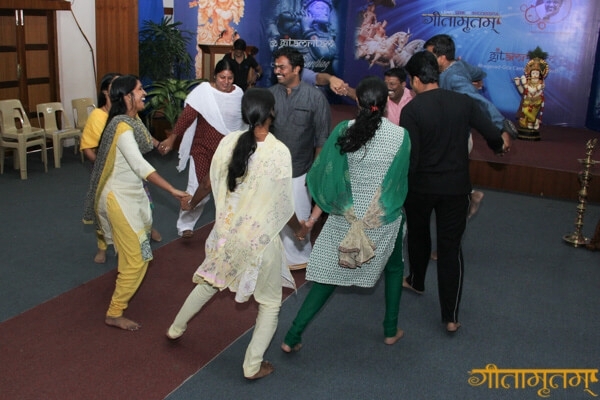 He said that while dancing he learned so much about the deities and this was not just physical but he experienced them mentally and spiritually and became one with them. He said unless you truly believe in the stories and that they are Gods, you cannot portray them genuinely. 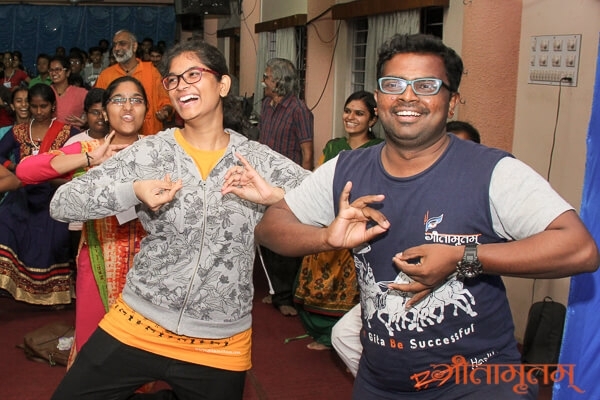 He says when he dances as Parvathi he becomes Parvathi. 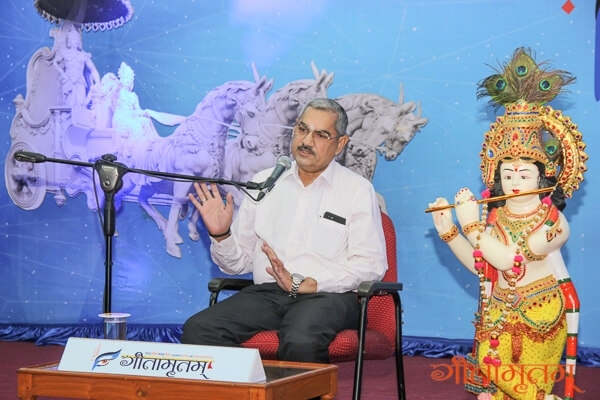 He eloquently explained that he becomes more than a devotee, and that is the strength that dance gives, and this helps transports the audience. He says he believes it is his destiny to become a dancer, and that can be seen from the way he followed his passion and overcame so many difficulties to pursue it. 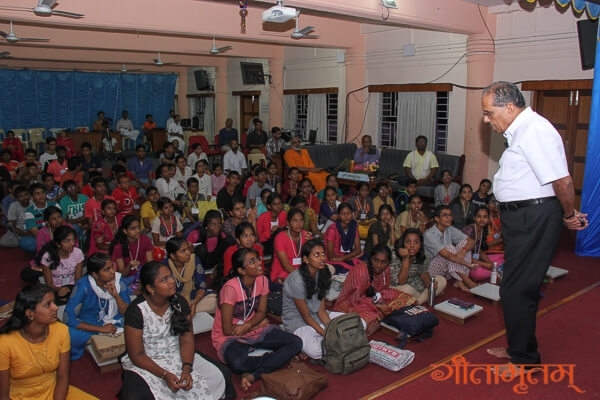 He advised the students, that to do anything in life, it takes some struggle and constant fight to help achieve it. He said that one strong love and desire should be there and we should surrender and God will give strength to open doors in this journey. When you are happy & comfortable with your life, love every moment of what you do, and wake up looking forward to it every day, there is nothing more you need. You may have small struggles, but you should be ready to fight for it and achieve it. 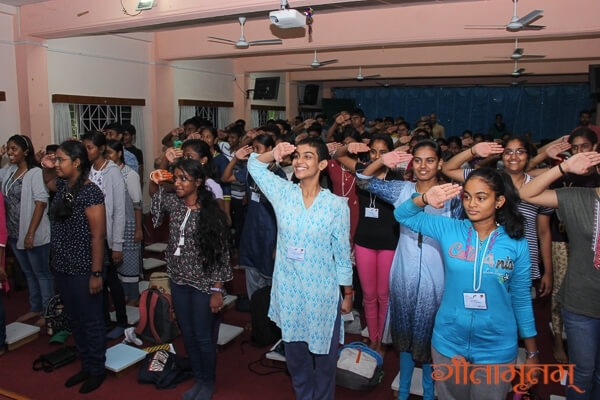 He concluded the inspiring session with a small demonstration and made the campers do a few steps along with him, leaving them inspired and motivated to pursue their passion in life. He opened our eyes to towards our passion which we had never given a chance to grow. 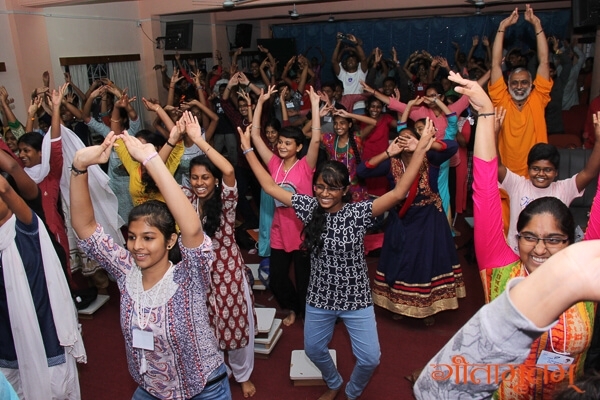 – Anjana, Mathipriya, Vidya & Anirudhan. He is our role model. – Keerthana and Prathiksha. He has inspired us. 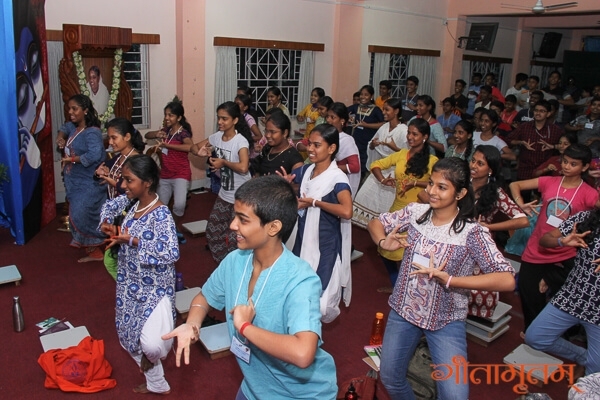 – Keerthana, Anjana, Aditya, Amrit Subramaniam, Aishwarya, Yashas Kumara Adi & Ramyadevi. Amazed at the fact that he “blew up the stereotyping and labelling of society”. – Aditya & Ramyadevi. But most of all you have inspired many students to overcome their obstacles and pursue their passion. What Samadhan a 15 year girl Renu Singh can give? Adv. Renu Singh had very humorous and filmy childhood story. She shared with the children the mischievous pranks she played in the earlier days of her life and her journey of Samadhan has started. 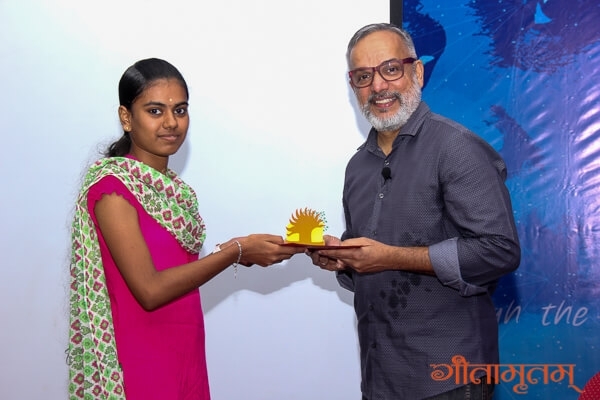 The turning point of her life happened at the age of fifteen, when she stopped at a petrol pump in her motor bike, she saw a girl of age between 8-10 at a ration shop nearby. To her surprise she found that the girl was covered in fresh blood. She took her motor bike near to the girl and the girl jumped onto her bike. She took her home and her mother suddenly called her friend who was a doctor and the doctor found out that the girl was sexually abused by her own father and she was 2 months pregnant. However, she had to leave that girl with her mother. Six months later, Renu learnt that the 12-year-old was married off to a 42-year-old widower only to be found dead in a village pond within a week. After this incident she was very much sad and wanted to do something to protect such women. 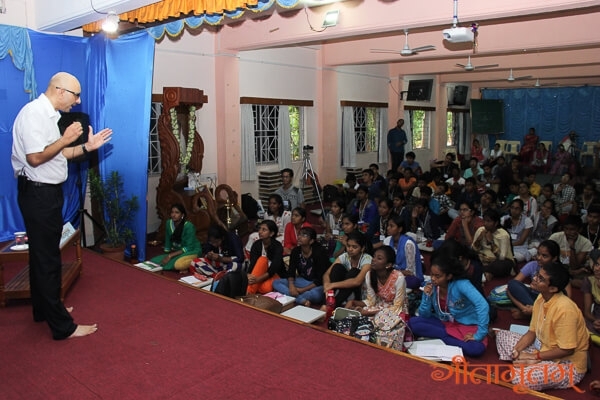 After completing her degree in law, she has been constantly imparting legal awareness, capacity building and empowerment training to women of rural areas especially from the hilly states of Uttarakhand and Uttar Pradesh. 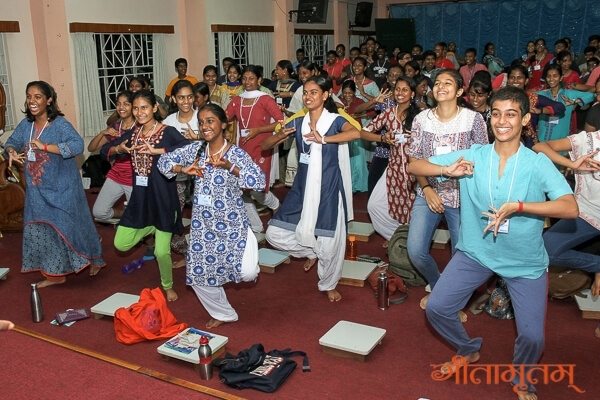 Samadhan has rescued nearly 3800 women victims of violence rehabilitated and educated them. Most of them married and settled now. 1700 of them are practising advocates. 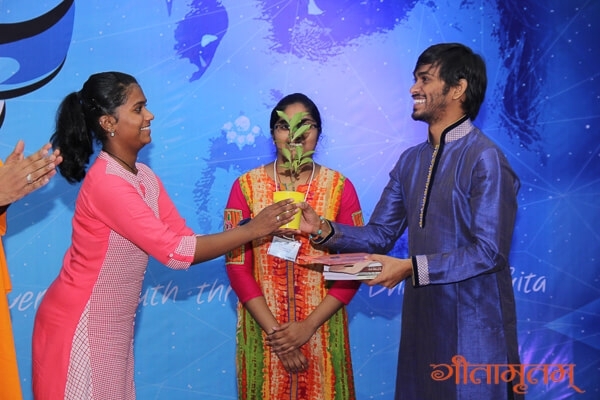 From her life story all the participants found an inspiration and would be able to stand up for a good cause for the society and find courage for doing that. I understood the purpose and meaning of life. I also understood that we are the instruments in the hands of God. We should fight for the welfare of the society. Her humor and wit had us rolling around laughing. Her life shows that we can do anything we want to do regardless of our age and limitations. I think I need her boldness. She is a great person who has fully surrendered to the Supreme power. I saw that bliss in her. Her boldness, courage and honesty is something we all can take with us. What she does and the person she is was truly inspiring. I learnt about the goodness of helping people . 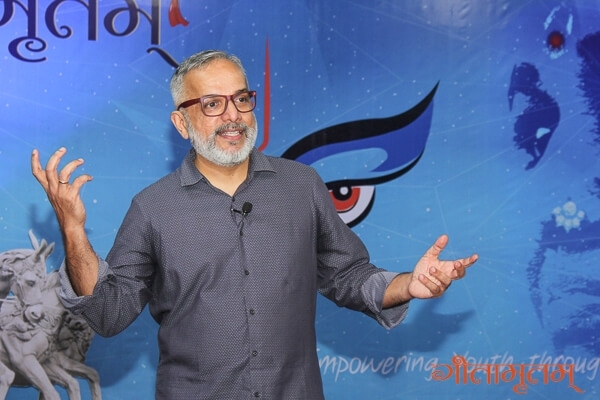 I will also join her team and after 5 or 6 years, I want to address as a guest speaker in the My life, my passion session at Gitamritam in the future. She inspired me to never give up on who we are, what we do and also our dharma. 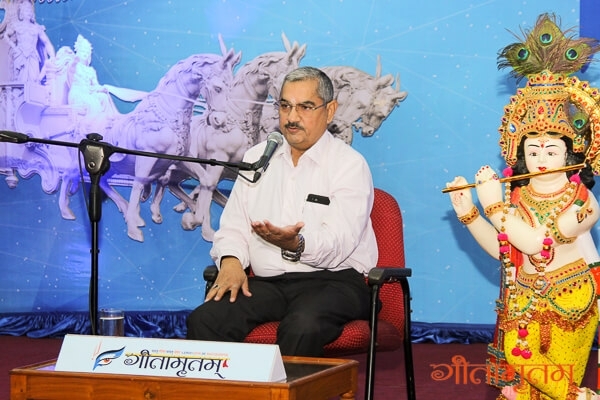 I learned the role that Bhagavad Gita plays in our life. Her dedication, willpower and faith is an example to us. I learnt that we should always be happy doing our own work. Whatever the world may say, we should carry on. Extremely strong. She is serving society and her lifestyle teaches us what Gita says. Her hard work towards saving the girls is exceptional and can a make change in everyone’s life. A wonderful help for the society by saving and empowering women and children who are abused. I saw a person who is rough outside and soft inside. No matter what others would think of us, we must be bold and should help others in situations of need to actually learn and practice what is said in the Bhagavad Gita. She is very mischievous! She has a soft mind but she didn’t show it. That is what a person should have. Actually she was too hilarious..!! I enjoyed alot. I liked her positive attitude towards every instance in life and her urge to help women in trouble. She is a very good follower of the Bhagavad Gita and I found what she said about the Gita was true. Her life story is like a movie, it is too funny..!! The importance of the Divine in our lives and the teachings of the Gita is what makes her happy even till today. Dedicate yourself to a purpose, don’t run behind God, do something that will make God rush to you ! Wow! A totally different person in childhood and at present. One incident changed her life and now she has so many troubles but never worries about it. 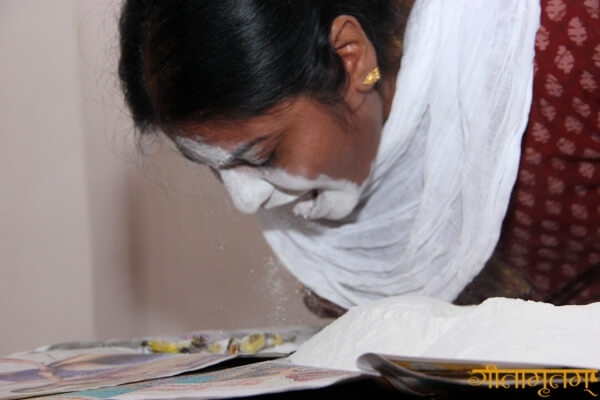 A great disciple of Amma…Whatever she does she offers it to the Lord. She is just amazing.. The work she is doing is great and because of her speech I am convinced that I should join her when I am 18. I will always look up to her as a role model because she took 200 pills to save another girl’s life. She fights for her girls with her life like a real mother. I learnt how to help people by doing social work. I loved her because she is strong enough to fight with the world. I would like to become like her. I don’t have any words to describe her because the work she is doing…. I loved it and from today I will also help everyone. She taught me that life is a drama with full of surprises and secrets. I also loved the way she helps the society. A humorous lady with full of happiness !! She is a humorous, loving, sweet, charming, dedicated and a stubborn lady who works for the welfare of our society. 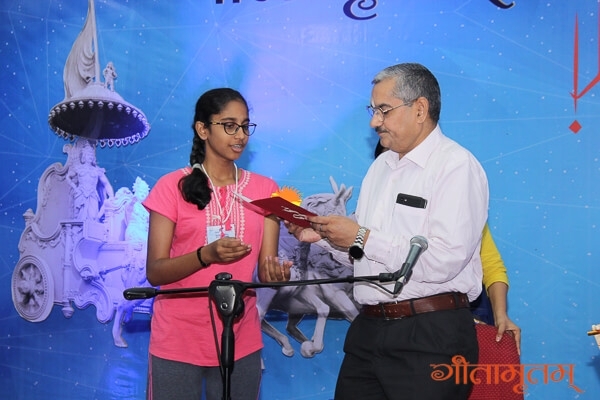 She is a role model everyone can look up to, to understand the concepts of the Bhagavad Gita. She is a very passionate lady. I like social work. I like to do it. So, she is my role model. An inspiring lady who has the guts to save her life from her uncle and to work for the welfare of abused women and girls. She also fights for children to protect them and she is happy doing all that. I want be like he like her, happy and with a helpful mind. She is so cheerful, happy and sweet. As Dhyanji said, she is like a coconut…Strong and bold outside but soft and sweet in the inside. Really really enjoyed her session ! Her humourous and outstanding description of her life was a new lesson for all of us. Loved her talk! Loved her work ! From her life story, her childhood, her inspiration, her work, her “marriage” 😛 , her present, everything was so awesome! It was an enriching experience. I learned that we can be always happy, at any moment of our life. Just trust the lord. 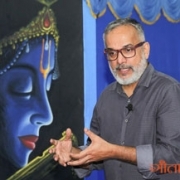 https://www.gitamritam.com/images/RenuDSingh2.jpg 200 300 Sanjaya https://www.gitamritam.com/images/gita-weblogo.png Sanjaya2015-05-30 12:05:172019-01-11 22:57:40What Samadhan a 15 year girl Renu Singh can give? 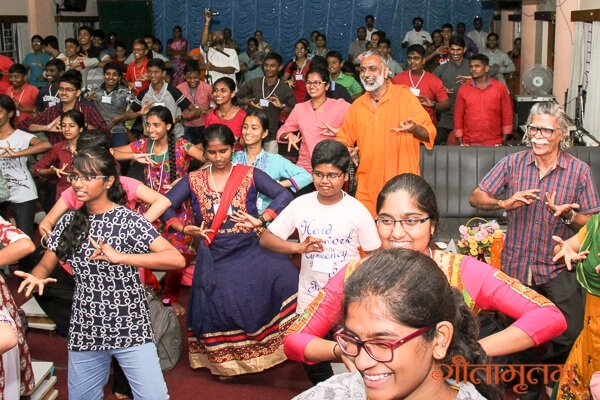 Sankaran Kumaran, Prof. & Head of the Depart of Cultural Education, Amrita University Bangalore, conducted several games and activities, through which the participants’ innocence and awareness is awakened. 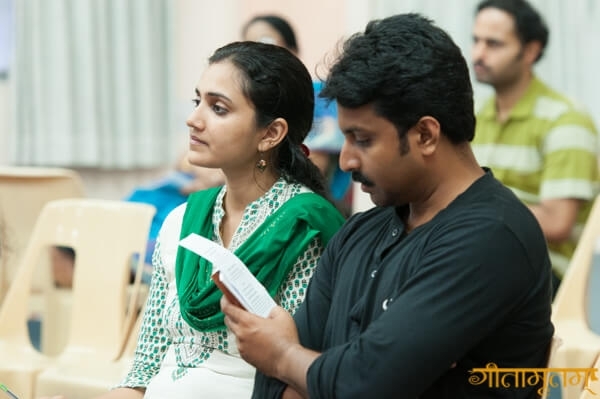 Valli Kannu: I very much enjoyed the workshop. It brought back the child in us – especially playing Ring Around The Rosies. 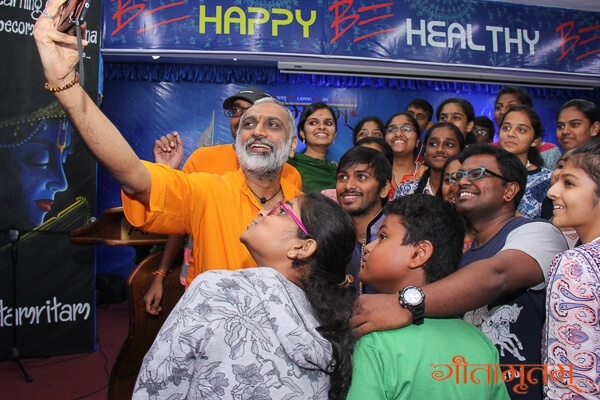 Dr.Dhanya Prasad: I realised that one can be carefree like child once more – doing whatever we feel. Anila: He made us understand many things which would be very useful in our lives in a very simple way. Very entertaining too. 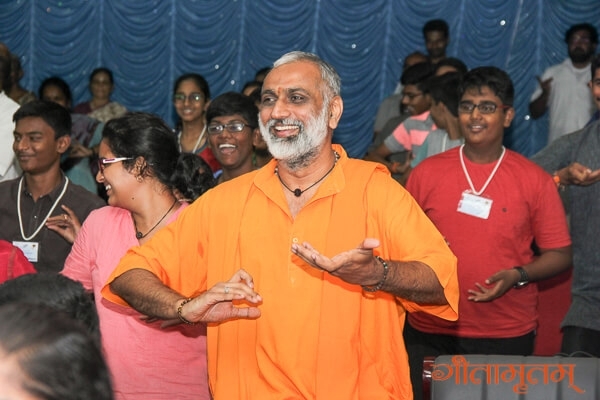 Shyam Kumar: Energetic and fun. Nidheesh.M: Excellent. He could show us the vast knowledge of our scriptures. 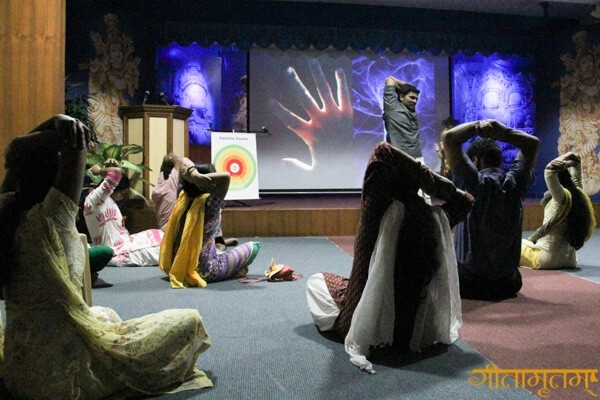 He is very instrumental in AMMA’s hands as he practices and imparts the knowledge he has acquired. 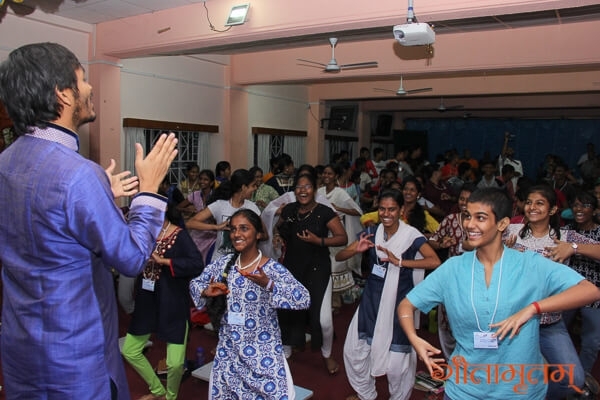 Medhini Menon: Loads of fun!! I realized the value our senses! 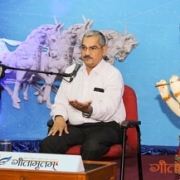 Shanti K: Good presentation of the topics. Strong words which helped others think about the topic later. Giving knowledge through fun. 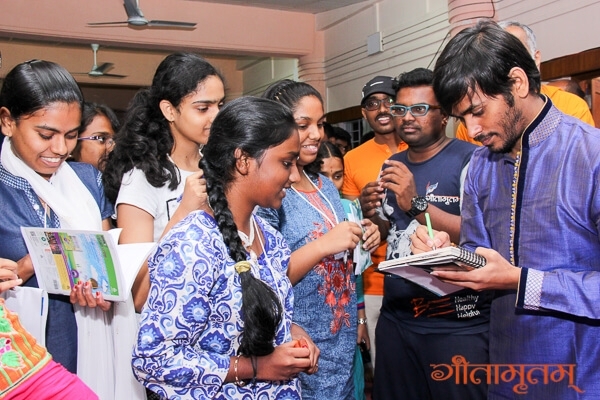 In the evenings, attendees had swimming lessons coached by an Olympian Ahkilesh Matti Rajakyla, who also has crowned in many international swimming events. Dr. Sanjay Banerji started the interaction by remembering his mother who was instrumental in helping him achieve his dreams. He shared the story of how he met his wife and then decided to get married. He constantly mentioned the support he receives from his wife – especially noting her support when he decided to leave his job to pursue his Ph.D. 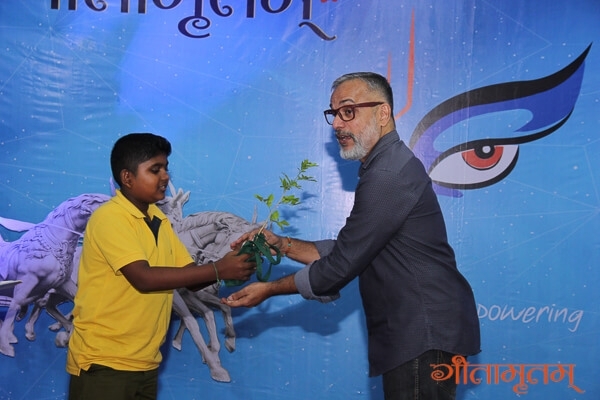 He was joined with Mrs. Banerji and their son who is a journalist who came to hear the story of his mom and dad. 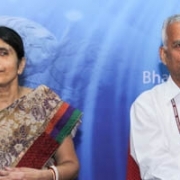 Mrs. Banerji’s vision deteriorated after their marriage and she ultimately lost her vision. He talked about how his wife, in spite of her disability, managed to perfectly run the day-to-day household duties, including cooking. The couple also talked about the good relationship Mrs. Banerji had with her mother-in-law. The family also shared the small jokes and pranks they pulled against one another. S. Subramanian: Love is the only word. Valli Kannu: Mrs. Sanjay Banerjee said that for her, her husband is more than God. Her husband gave her everything she wanted even when God sent her here with defects. I also learned that we should not make excuses for our disability – we should take responsibility. Dr. Manjula Arun: A joyful family. I admired seeing the understanding between the family members. Her husband is more than God. Salutations to that dharmapatni. Dr. Dhanya Prasad: They showed that under any circumstances, partners should cooperate with each other and become each others’ strength. 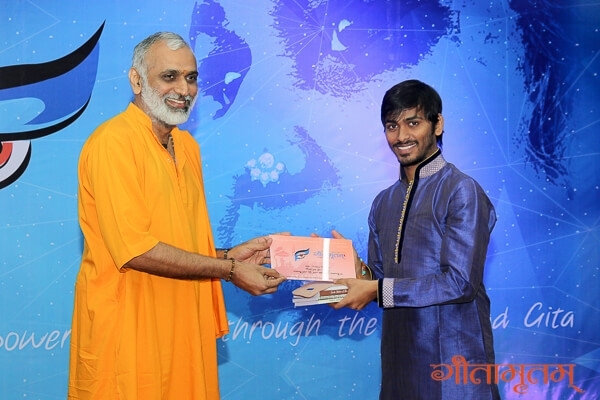 Diljith: A real example of what Gitamritam stands for. Anila: First, I should bow down to their wonderful hearts. Her statement “God gave me disabilities but my husband gave me everything and he is considered as God,” just resonated with me. Shyam Kumar: A partner’s physical disability is not a hindrance for having a happy life as husband and wife. Durgalashmi CV: “Consider your husband as God” This is the beautiful message I got from them. 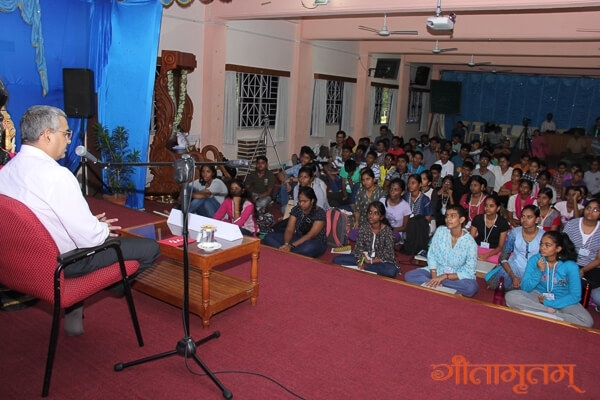 Medhini Menon: A very heart-touching session. I learned a lot from this beautiful couple!! 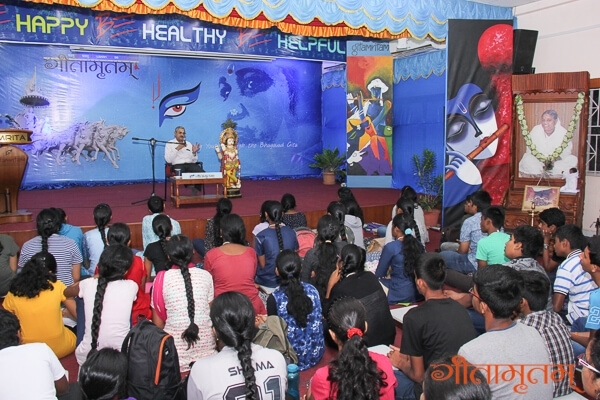 A four-day Gitamritam Camp was held on 20-24 Nov 2015 at Amrita University Campus, Coimbatore. Br. 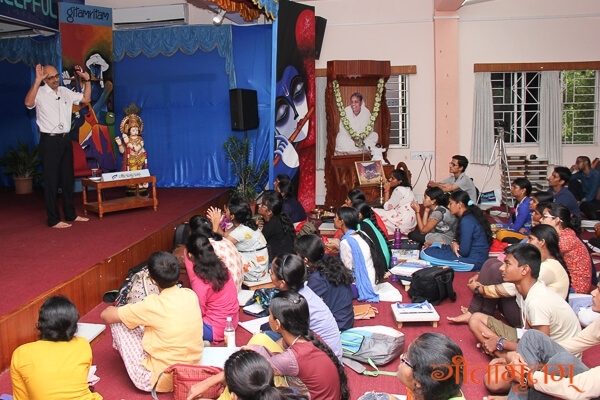 Dhyanamrita gave the class on Bhagavad Gita 12th Chapter to the couples. 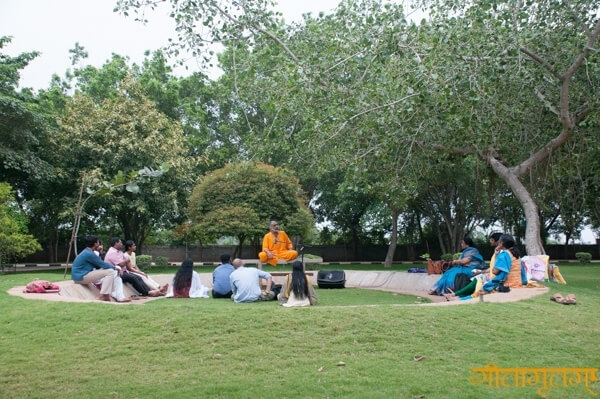 the 4 day camp for couples which focused on the family and drew upon the teachings of the Bhagavad Gita. 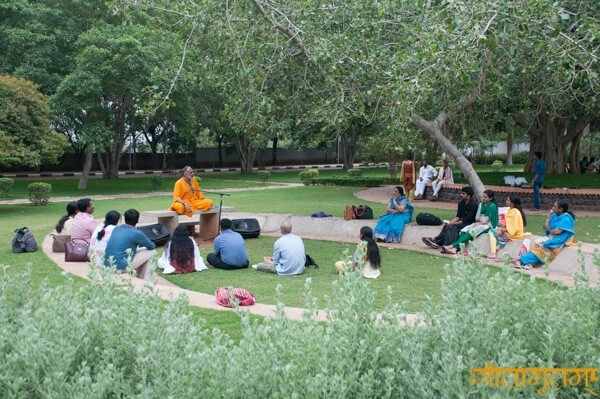 With the outdoor sessions, connecting with the guest speakers and the workshops, he made participants realise the need to imbibe the values of Gita in daily life. He gave the example of how Amma is a role modal – leading life in the house, executing all her household responsibilities, converted all actions in to worship and realised God. 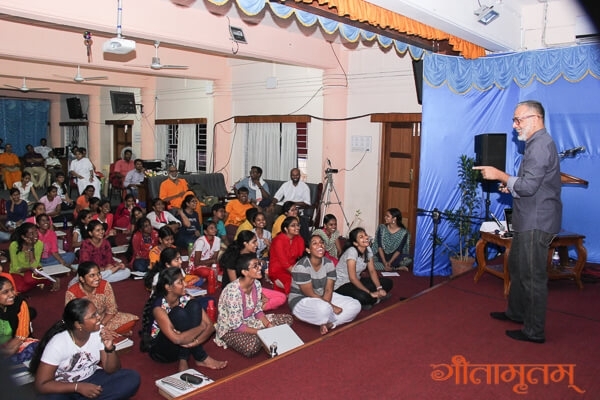 The explanation of the Slokas with examples, stories, and how to apply in life were very down to earth and easily understandable. 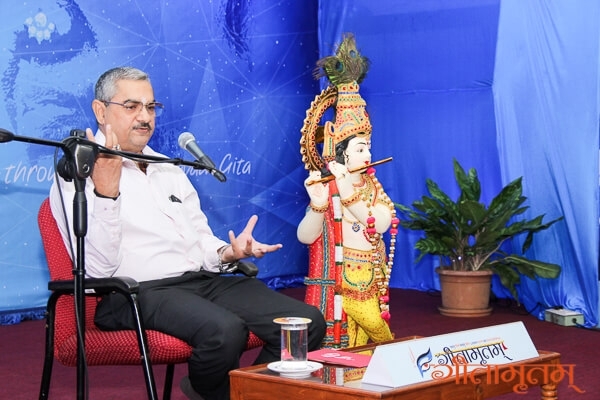 When I came to the Gitamritam I didn’t know the Bhagavad Gita. For me, it is only a Sanskrit book which I didn’t understand. 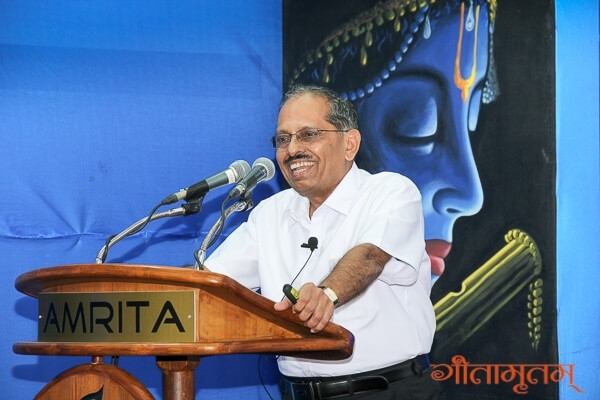 Now I have confidence that I can read the Gita and get good values for my daily life practice. I realised that we are all Arjuna in one way or another. Gita is the Mother who can lead us through any situation by giving the strength to face life and lead a happy life. I can feel the taste of real divinity. 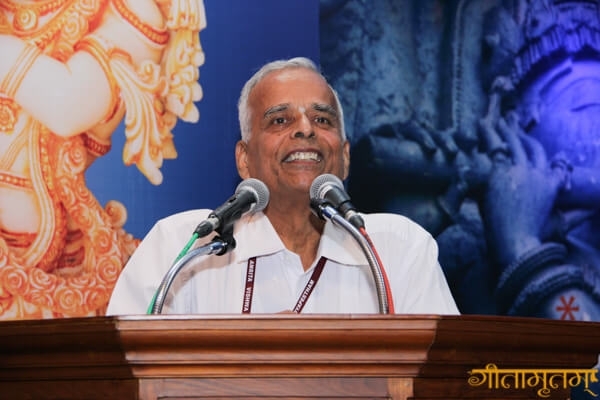 I tried to understand what Bhagavan expects from us as human beings. I think now it is time to practice it. Enlightening. 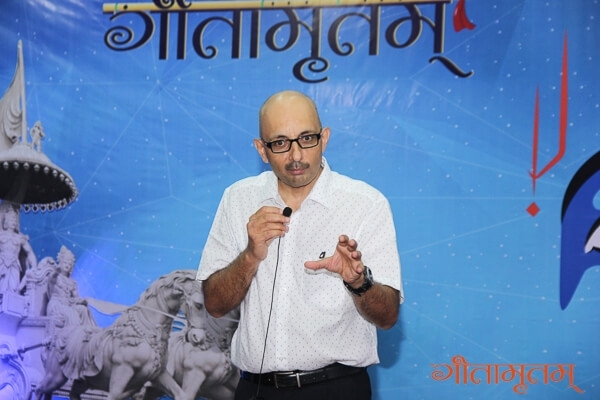 Dhyanji was very simple in explaining the 12th chapter. He gave very practical examples to which we could easily relate. Excellent. Wonderful sessions. Really eye-opening sessions. The class was excellent. 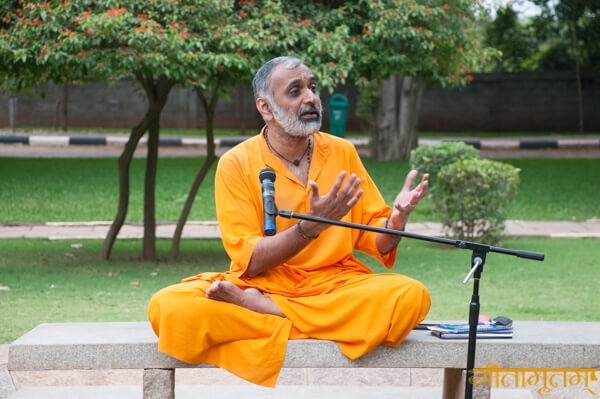 Informative, simple examples were given by Swamiji which were understandable. 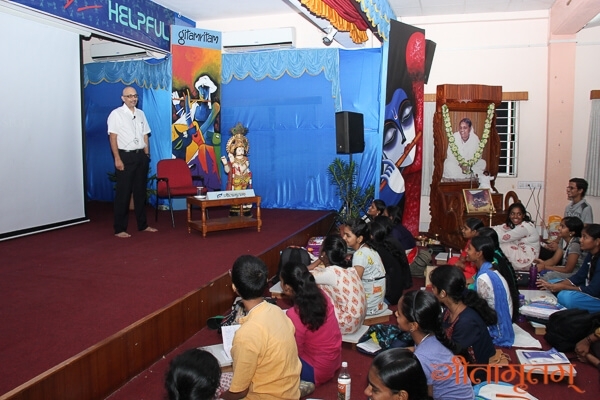 The class was a most apt way of helping us make GITA our way of life. Especially by quoting a lot of practical examples that we can relate to on a day to day basis. It was a very simplified way of making others understand about the essence of life. An eye-opener.